1. 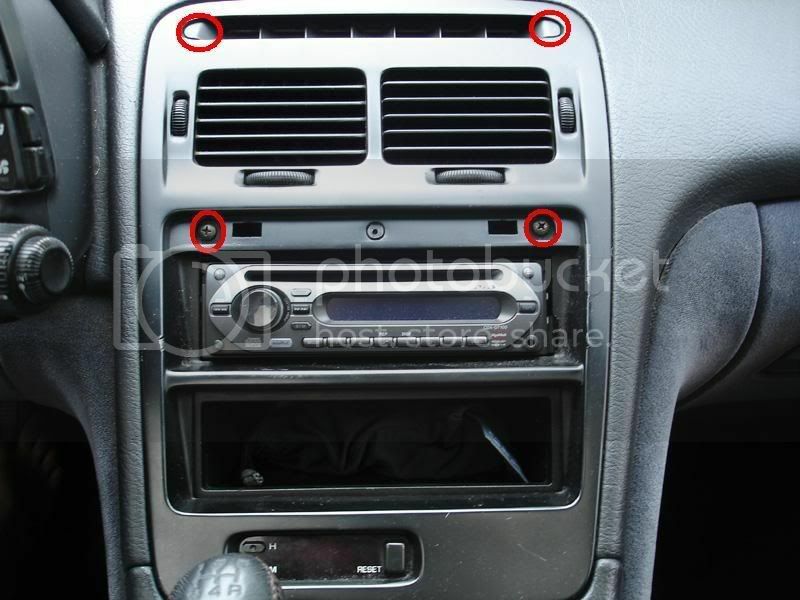 Remove the radio bezel by removing 4 phillips screws (red circles) that are hidden behind some clips. The bottom two in the following picture already have the plastic strip removed. The top two still have the plastic clips in. 2. 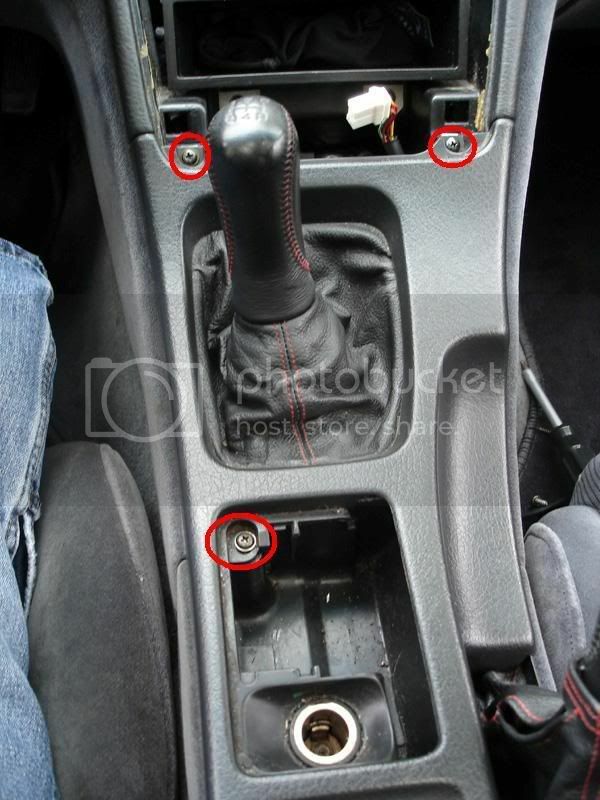 Remove the center console by removing 3 phillips screws (red circles) and removing the shift knob by unscrewing the shift knob. 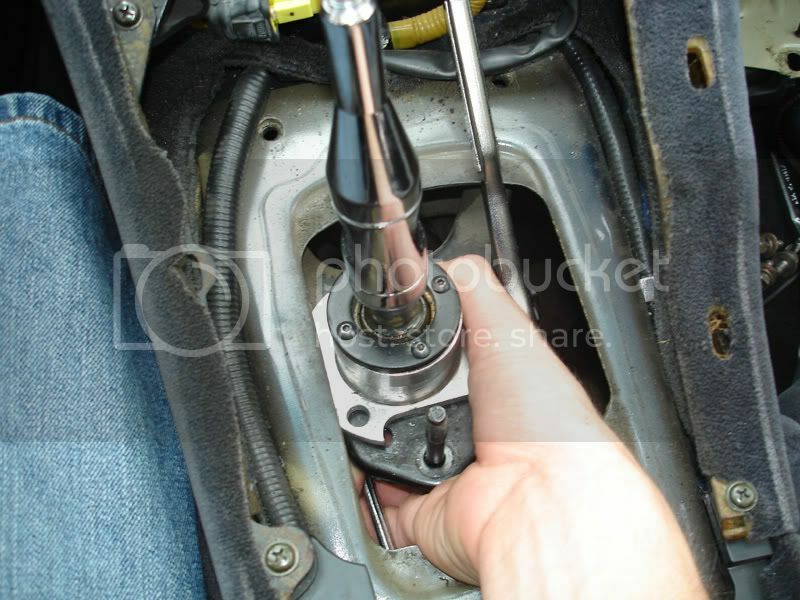 If you have never removed the shift knob before, this part will be really tough as Nissan put lock-tite on the threads. 3. 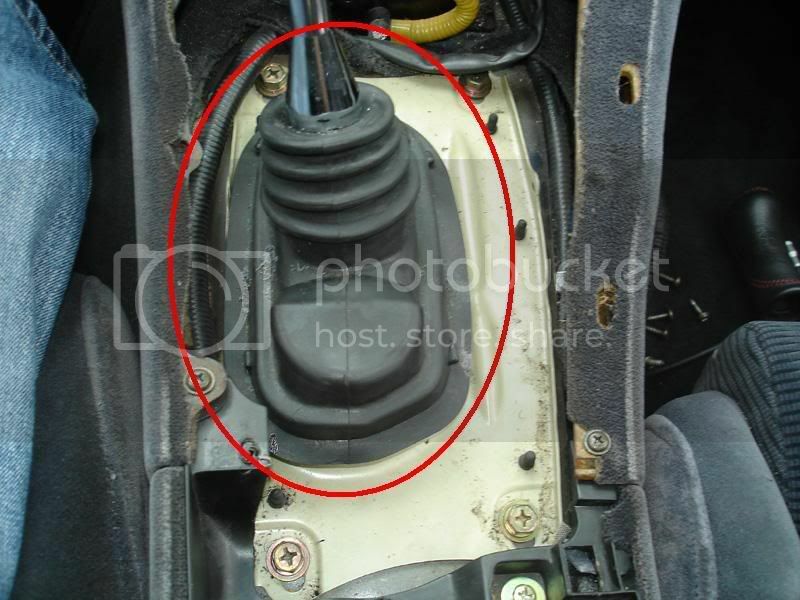 Remove the upper dust boot (red circle). 4. 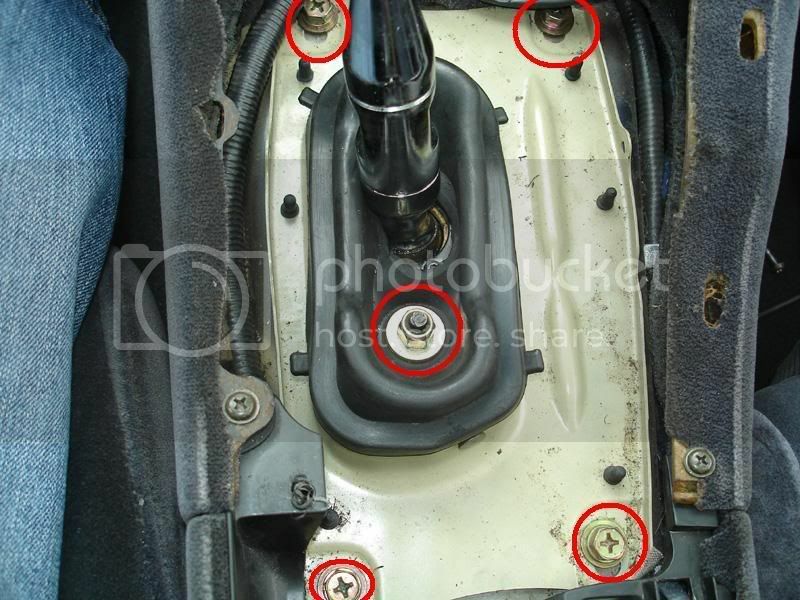 Remove the shifter bracket by removing the 5 12mm bolts (red circles). 5. 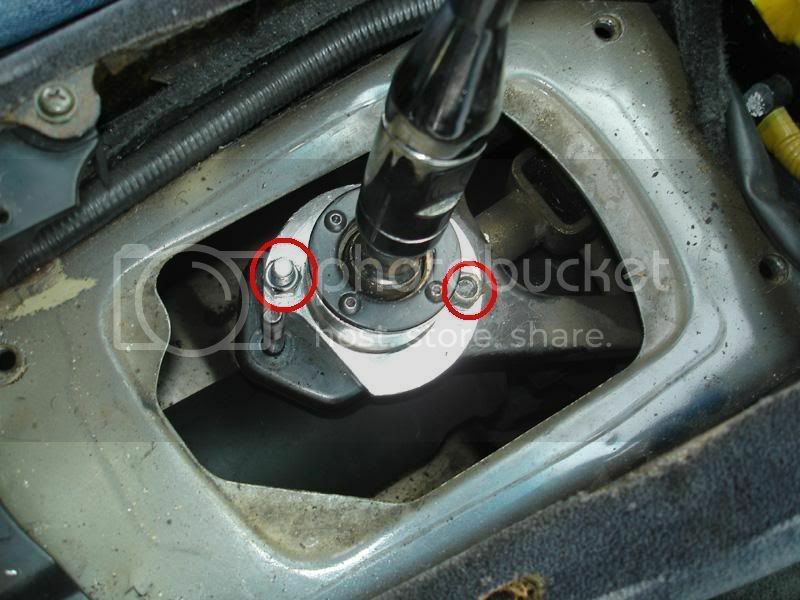 Remove the the 12mm nut and the 12mm bolt (red circle) where the shifter attaches to the bracket. The bolt has a nut on the topside (it might be switched around, I removed my shifter before I took this pictures and can’t remember if I switched it around or not) and is difficult to get off. 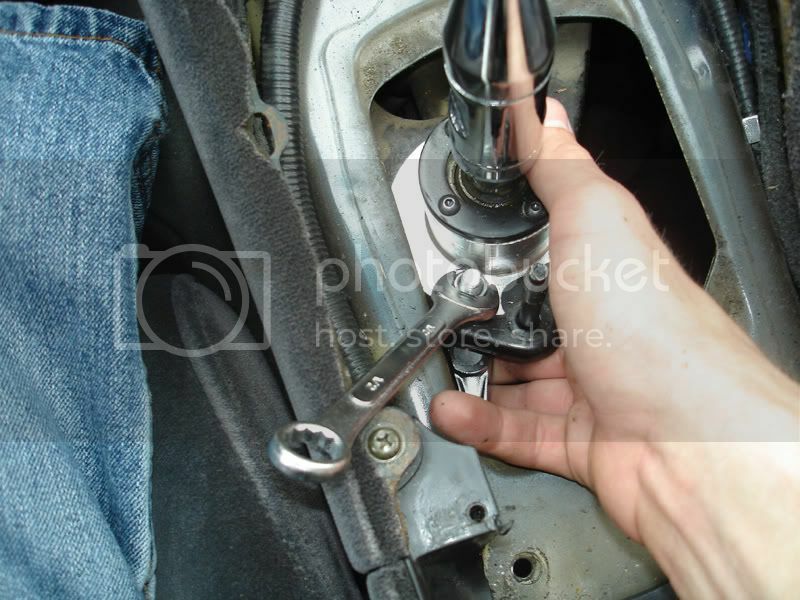 You have to hold the bottom side of the bolt with a ratchet or wrench, and loosen the top side at the same time. The second pic illustrates this. 6. Now for the most difficult part to do. The shifter is attached to the linkage by a 12mm bolt with a 12mm nut and washer. There is not room to fit two hands down under, so you have to manipulate the wrench and pieces with one hand squeezed down there. What I did was I put the boxed-end side a 12mm wrench on the drivers-side of the bolt and held it one there with three fingers, and then put a 12mm socket on the passenger-side of the bolt and used my other hand to loosen it. When you finally get the nut off, remember that there is a washer on there, don’t drop that. If you do drop anything (which usually happens with me), it usually just drops through the car and to the ground. Here is a pic illustrating what I’m explaining. 6. Reverse the steps to reinstall. Reinstallation is a little bit tougher because, like I said, you can only fit one hand under the shifter, and so it is hard to get the nut started on the bolt.